The use of multiple strobes can be considered for a couple of reasons. It is true that the main benefit is to reduce harsh shadows but, as a by-product, you are also able to increase your exposureRecording light onto photo sensitive devices and materials by a stop, and get wider-angle coverage. It is worth pointing out that, because of the inverse square lawThe quantity of light falling on a subject is inversely proportional to the square of the distance from the source, in order to gain an extra F-stopStandard unit of exposure. A means of expressing the illuminating power of a lens regardless of its focal length. you must double the number of strobes (so to gain a stop more than two strobes will give you requires four, eight if you want another!) This is clearly impractical. To calculate the combined guide numberA number used to represent the illuminating power of a photographic flash for comparison of efficiency with other flash units. for two (identical) strobes multiply the individual guide number by 1.4. Using two strobes is extremely popular and a natural progression. Once again the photographers who do best on manual do best with two strobes! The basic principle is that one strobe will always 'win' through being more powerful or closest to the subject. We call this the key light and try to balance the second strobe, which we call the fill light with it. The degree of fill determines the lighting ratio. A very pleasing ratio is achieved when the fill strobe is between one to two stops under the key light. This just adds contrastthe difference in desity between parts of an image. High contrast for example denotes larger differences with blacker blacks and whiter whites. to the shadows without destroying them. You should select a strobe of appropriately lesser power, or set to half or quarter power. You don't really need your fill strobe to be TTLThrough The Lens. A term applied to viewfinders and metering systems that operate behind the lens. As such TTL is accurate because it sees what the lens sees.. A second, slave type flash can be used provided you make sure it is less powerful than the main strobe and you use an apertureThe variable diameter hole used to control the amount of light passing through a lens. guaranteed to make your TTL main strobe fire at near to full output. With two strobes you risk lighting up the suspended particles in the water from two directions, so you might imagine that multiple strobes increase problems in that respect. 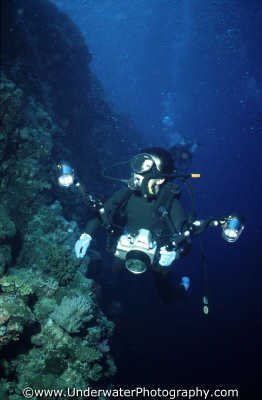 In practice backscatterBackscatter is light reflected from suspended particles in the water a problem in underwater flash photography caused by having the flash too close to the camera lens. is usually reduced. With two strobes you also have twice as many aiming problems however. Be aware of accidentally creating 'hot spots' where coverage overlaps. On a limited budget, the purchase of a second strobe should seriously be considered a priority to buying a second camera, as it gives a better return in terms of making a difference to picture quality. You can't use two cameras simultaneously - but you can two strobes! One thing is certain - you will not win competitions with on camera flash, whether you use one, or two; and surely a more artistic way to use two or more flashguns is to point them in different directions! Selectively highlighting areas, preferably with subtlety, can transform an otherwise dull shot.